There is much excitement this year in Durham as 'The Lindisfarne Gospels' return to the North East for the first time in 12 years. The Gospels will be on display from 1st July – 30th September 2013 with a summer festival of events to celebrate their arrival in Durham. 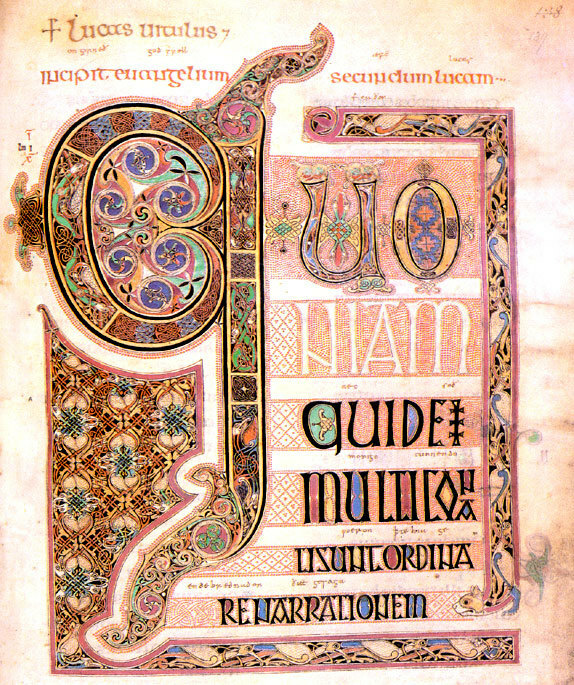 Written in the 8th Century A.D. on the island of Lindisfarne (also known as Holy Island) off the Northumbrian coast, these original Illuminated Manuscripts represent a major expression of devotional work by Eadfrith, Bishop of Lindisfarne, who died in 721 AD. It is thought that the work took between five and ten years to complete. Originally written in Latin, it was translated some three centuries later with Anglo-Saxon script added by a monk named Aldred and is widely recognised as the earliest translation of the Christian Gospels into English. Holy Island was a key site of Christian pilgrimage during this era and continues to attract similar audiences today, as well as local people and overseas tourists. 'The Lindisfarne Gospels' were a 'must see' for pilgrims of the day and their importance in English history as an original artefact is precious. 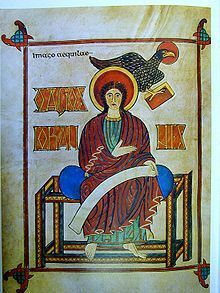 Following the 8th Century Viking raid and the Sack of Lindisfarne, the gospels were carried for over two centuries by pilgrims who were guarding the relics of St. Cuthbert and other holy artefacts before coming to Durham in 995AD. The priceless manuscript survived in Durham until the Dissolution of the Monasteries in the 16th Century during the reign of Henry VIII. This period, known as the Reformation, saw Henry break away from the power of Rome and establish the Church of England. It is thought that the manuscript became the property of private collectors in London but has been housed in the British Library for many years. The quest to bring the treasured manuscript back to Durham had been launched by Durham University and this summer the precious document returns to Durham on loan. The exhibition takes place at Palace Green Library, which lies between Durham Cathedral and Castle in the heart of the city. There are several artefacts to see including jewel-encased book bindings and segments of religious texts from a similar era along with items from 'The Staffordshire Hoard', a collection of Anglo-Saxon artefacts found in Lichfield, Staffordshire in 2009 in a field which is believed to be the site of a battle as many of the items are fragments of weapons. Several thousand gold and silver items were found at this site and are believed to be contemporary with the Lindisfarne Gospels as there are many parallels with original designs found in these texts. Entrance to the exhibition is strictly in 15 minute time-slots so it's best to buy your tickets before you go. You may also be able to buy tickets on the day if there are any unsold tickets within a given time-slot available. Once inside you can amble around the gallery at your own pace but as humidity levels are strictly adhered to, only a few people at one time are allowed in each chamber. Light levels are low to protect the ancient documents. The exhibition, which runs until the end of September has had over 30,000 visitors from twenty-two countries in its first month. We've just been to see it and spent an absorbing 90 minutes inside the library without realising. And there was certainly plenty evidence of the exhibition's internation appeal as we wandered around Durham, where we heard several European languages spoken and saw visitors from far and wide. Colin even got a Scottish £5 note in his change at one place. Not a problem in this part of the world but can be tricky to spend the further south you go in the UK. I was okay with my medium sized handbag but there is a secure 'bag drop' station for larger bags and back-packs. In inclement weather you will be required to leave outdoor clothing in the adjacent cloakroom and photography is not allowed. Durham can be reached via the A690 just off the A1(M). Look out for the signs stating that this is the 'Land of the Prince Bishops'. Due to the historic nature of the city there are parking restrictions in place to avoid congestion. It is advised that you use the Park & Ride facilities available to avoid congestion charges. You can also arrive by train via the main line Railway Station which is served by trains from London Kings Cross to Scotland, Cross-Country and Trans-Pennine services amongst others. Regional and local buses also serve the city centre bus station. Newcastle airport is approximately twenty-five miles away while the city of Newcastle-upon-Tyne is 15 minutes by train or a 30 minute drive. Buses linking the Railway Station with Durham Cathedral cost £1 for a day ticket and run every 20 minutes during the day, calling at Durham bus station, market place and coach park. They are wheelchair accessible and are highly advised if you have walking difficulties as there are steep climbs and cobbled streets between the railway viaduct and the cathedral. Durham Castle is available as a wedding venue, so if you'd like to spend your special day in Durham here's the link.